Every woman needs to master at least two dinner recipes in case she ever gets to host a party. This roasted lemon chicken recipe came from a silly book, believe it or not, and I only tried making it to see if it was a joke last Thanksgiving. Turns out, this recipe was as serious as it was delicious, and very easy, too! Read on for the recipe. Preheat oven to 350F. Pat dry the chicken with paper towels and place it in a cast iron pot. Zest the two lemons. Pour juice from one of the the lemons over the chicken. Peel the second lemon and stuff it inside the chicken along with some rosemary (tie a bunch together so you can easily remove it after). Brush the chicken with soy sauce and rub with cinnamon. This will give the chicken a golden, crispy skin. Cut candied lemons* in half and add them in the pot along with the lemon zest. Thinly slice your onions and add them in the pot, if using. Bake 2 hours, turning over once after an hour. You can cover the chicken with foil if you see it getting too dark for your preference. 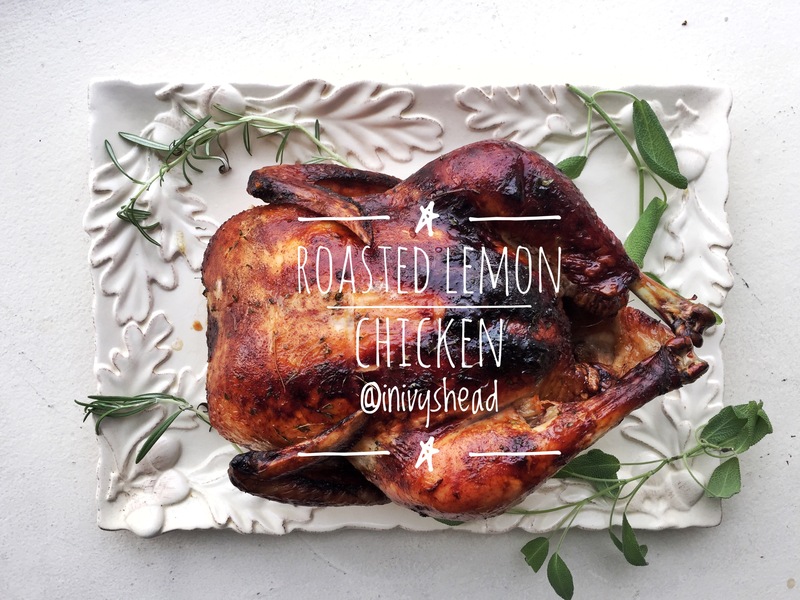 Serve your roasted lemon chicken with sides like sage roasted vegetables and potatoes or a roasted cauliflower head. Great as a Thanksgiving option if you don’t want to make turkey, or if you’re only feeding 2-4 people. Pair with a beautiful bottle of wine, like this beautiful Sonoma Coast Chardonnay. Enjoy! *if you can’t find candied lemons, use Meyer lemons, or boil regular lemons in water to take the bitterness out, then store in a jar with simple syrup (half water and half sugar mixture) for a few days in the fridge.